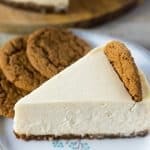 This creamy gingerbread cheesecake has a hint of gingerbread spice that pairs perfectly with the sweet and spicy gingersnap crust. Place gingersnaps and brown sugar in food processor or blender and blend until fine. Combine melted butter and gingersnap sugar mix in bowl until well combined. Pour crumb mixture into 7-inch push pan or springform pan and spread to make an even layer. Then, using the bottom of a glass or flat pyrex bowl, press crumbs down into an even layer. Use fingertips or spoon to press down around the edges of the pan if necessary. Place in freezer while preparing batter. Mix sugar with cornstarch in a small bowl. Combine sugar mixture and cream cheese in medium size bowl and beat until combined, scraping down sides with spatula. Add remaining ingredients to the cream cheese mixture and beat on low speed until well combined and smooth, scraping sides and bottom of bowl with a spatula as you mix. Remove cheesecake pan from freezer and pour batter into pan. Optional step: Tap pan lightly on counter to help air bubbles rise to surface. Pop bubbles with a toothpick until clear of bubbles. Place 3-inch trivet into 6-qt. or larger pressure cooker and add 1 cup water. Cover pan in foil and carefully place into pressure cooker on top of trivet. Cook at high pressure for 26 minutes, then allow a natural pressure release (will take from 20-30 minutes). Remove pan from cooker and uncover. Allow cheesecake to cool for one hour or until room temperature. Once cool, carefully run a paring knife around the edge of the cheesecake to separate from pan. Refrigerate for at least 6 hours, preferably overnight. 120 grams gingersnaps or 18 Stauffer's Ginger Snaps.